The earliest records of Muswell Hill date from the 12th century. The Bishop of London, who was the Lord of the Manor of Harringay, owned the area and granted 65 acres (263,000 m²), located to the east of Colney Hatch Lane, to a newly formed order of nuns. The nuns built a chapel on the site and called it ‘Our Lady of Muswell’. The name Muswell is believed to come from a natural spring or well (the "Mossy Well"), said to have miraculous properties. The traditional story tells that a Scottish king was cured of disease after drinking the water of the spring/well. The area became a place of pilgrimage for healing during medieval times The River Moselle, which has its source in Muswell Hill and Highgate, derives its name from this district; it was originally known as the Mosa or Mosella. 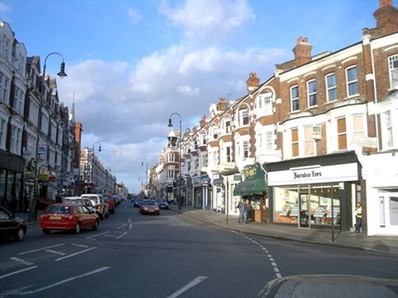 In the 18th century Muswell Hill was a scattered village consisting mainly of detached villas with large gardens. In 1787 one commentator wrote that nowhere within 100 miles (160 km) of London was there a village so pleasant or with such varied views. Little had changed by the middle of the 19th century. One of the houses of the time was The Limes. This house occupied the angle of Muswell Hill Road with Colney Hatch Lane and was a three-storeyed house with portico and two-storeyed wing approached by a double carriage drive through impressive gateways. The large grounds of the house extended to Tetherdown and included a lake. Opposite The Limes was Muswell Hill pond and beyond that the Green Man inn, built of stone. Further down the hill past the Green Man was the Elms a squat three-storeyed house later improved by Thomas Cubitt standing in 11 acres (45,000 m2), part of the grounds of which were laid out by Joseph Paxton. A short distance down the north side of Muswell Hill was the Grove, which was three storeys high and had nine bays with pedimented projections at each end. It stood in 8 acres (32,000 m2) of grounds which contained a 200 yard avenue of oaks. In 1774 the house was occupied by Topham Beauclerk. A little farther down the hill stood Grove Lodge, also in wooded grounds. Altogether there were eight properties in Muswell Hill worthy of note in 1817. Parallel with Muswell Hill was a track known as St. James's Lane which ran across a triangle of wasteland. By the middle of the 19th century houses were already dispersed along the lane at the foot of which was Lalla Rookh, a two storeyed villa with a wide verandah. Other buildings there were apparently cottages or huts, both single and in terraces. It was not until the end of the 19th century that Muswell Hill began to be developed more densely from a collection of country houses to the contemporary London suburb it is today. The development was spurred by the opening of abranchline railway with connecting services to Finsbury Park and Kings Cross stations. Most commercial development was initiated in the early 20th century when the current street pattern was set out and elegant Edwardian retail parades were constructed. The centre included a music hall (later demolished with the site redeveloped as a supermarket) and several churches for various denominations. The 1930s saw the construction of an art deco Odeon cinema. The site of the Ritz, a cinema formerly at the top of Muswell Hill, has been redeveloped as offices. Until the mid-20th century there was a rail branch line, the Muswell Hill Railway, from Highgate which passed through Muswell Hill, terminating at a station at Alexandra Palace. It was intended under theNorthern Heights plan to integrate this into the London Underground Northern Line; some contemporarytube maps (e.g. the 1948 map) showed the line as being under construction. However, this plan was cancelled after the 1939-45 war, and the railway line was abandoned in 1954. The line was later converted to become the Parkland Walk. Until the reorganisation of London's local government in 1965, Muswell Hill formed part of the Borough of Hornsey within the administrative county of Middlesex. The area subsequently became part of theLondon Borough of Haringey. Muswell Hill railway station was in the Muswell Hill district of north London just north of the road junction of Muswell Hill and Muswell Hill Place. Nothing remains of the station, Muswell Hill Primary School is on the site. 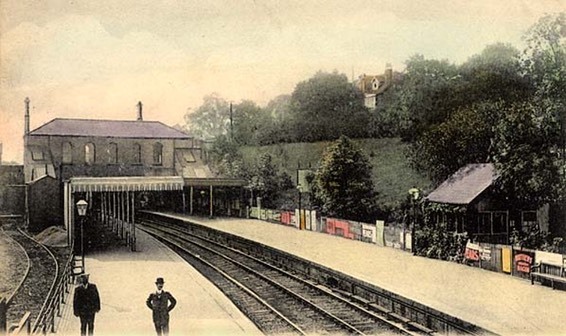 The Muswell Hill Railway (MHR) opened the station on 24 May 1873 as the intermediate station on its line from theGreat Northern Railway (GNR) station at Highgate to Alexandra Palace station as "Alexandra Park (Muswell Hill)" to coincide with the opening of Alexandra Palace. The station name was changed to the final form in 1875. The other intermediate station on the line, Cranley Gardens, did not open until 1902. In 1911 the line was taken over by the GNR. The 1921 Railways Act created the Big Four railway companies, and in 1923 the line became part of the London & North Eastern Railway (LNER). In 1935 London Underground planned, as part of its "New Works Programme" programme to take over the line from LNER together with the LNER's routes from Finsbury Park to Edgware and High Barnet, modernise it for use with electric trains and amalgamate it with the Northern Line. Works to modernise the track began in the late 1930s and were well advanced when they were interrupted by theSecond World War. Works were completed from Highgate to High Barnet and Mill Hill East and that section was incorporated into the Northern Line between 1939 and 1941. Further works on the section between Highgate and Alexandra Palace were postponed and the line continued under the operation of the LNER. Because of wartime economies services were reduced to rush hours only, so that after the war the dwindling passenger numbers and a shortage of funds lead to the cancellation of the unfinished works in 1950 and passenger services to Muswell Hill station were ended by British Railways on 3 July 1954 along with the rest of the line between Finsbury Park and Alexandra Palace. The line was used for goods until complete closure on 18 May 1957. The track was subsequently removed and the platforms and station buildings were demolished. The track bed between Muswell Hill and Finsbury Park is now aParkland walk.